Spray Lake Sawmills is holding two Open Houses next week. These are good opportunities to let SLS know what you think of its logging plans. See you there. The application to the court states that; 1) there was a reasonable expectation given these decisions that the Castle was already protected; 2) that if the government was going to allow new logging in the Castle then people should have been properly consulted; and 3) that the mandate of the government to protect other values such as water, wildlife, recreation, and the local tourism economy isn’t being considered in allowing logging to proceed. Logging in the Castle by Cochrane-based Spray Lake Sawmills started in February. This is the first year of three that logging is scheduled to take place west of Beaver Mines, Alberta. 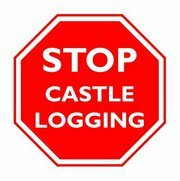 Groups and many regional residents have been asking the logging be halted and a Wildland Park be created to provide better protection for the Castle. Petersen and others have been advocating for the protection of the Castle for more than 20 years, and have been fighting the logging plans since they were announced two years ago. 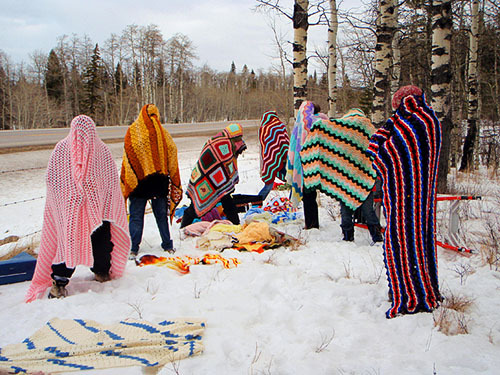 Recently, local residents and business owners maintained a protest camp in temperatures as low as –35° C to raise awareness of logging in the Castle. Several members of that group were arrested and banned from accessing public land in the province. Proceedings have since been dropped. The application was filed with the Court of Queen’s Bench on April 18, 2012. Provincial officials have decided not to charge anti-logging protestors who were arrested on February 1 in the Castle Special Place. In addition, protestors who were named in the related Court Order will not be appealing that Order in court. Lawyers for the protestors, and the Crown’s lawyer, reached an out-of-court understanding where no further action will be taken against those arrested, and where the Court Order will be allowed to expire. For more than three weeks, and braving a cold snap where temperatures plunged to –35°, dozens of local residents, business leaders, and activists protested logging in the Castle Special Place. The area, designated a protected area by Cabinet in 1998, is critical for the protection of Southern Alberta’s watershed, as well as part of an international conservation area for the endangered grizzly bear. Logging began shortly after four people were arrested on February 1. Local activists are planning to continue with court action of their own. In addition, they continue to call on citizens across Alberta to make their voices heard by calling the Premier and their MLA’s at 310-0000. 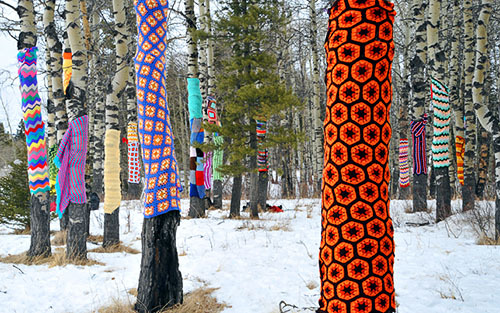 An anonymous group of a dozen artists spent several hours producing a visual statement about caring for our environment by “Yarn Bombing” a group of trees in the Castle Special Place, near Pincher Creek, Alberta. Each handmade afghan becomes a metaphor for nurturing and warmth. Art Works For Wild Spaces created this spontaneous event to direct attention to the need to protect the Castle. 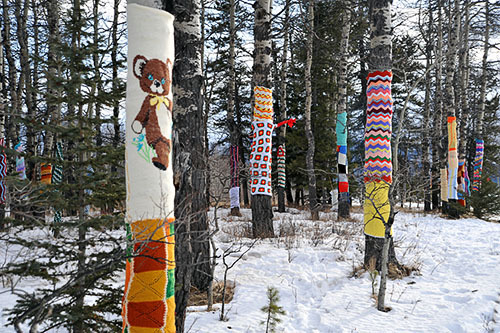 The yarn-bombing site is along Highway 774, 4 km south of the area that is presently being logged, and just north of the turnoff for Beaver Mines Lake. This is a temporary public art project. After a period of time, the trees will be unwrapped. 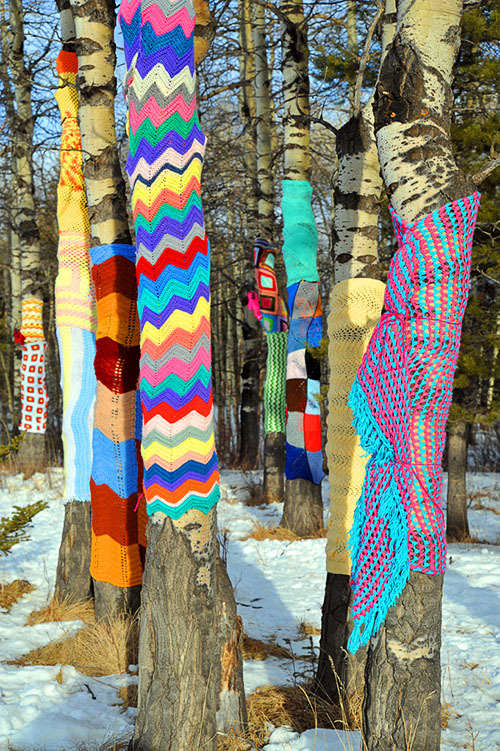 In the meantime, the group hopes that many will enjoy the installation, and that many will pause to reflect on the “knitting together” of people, their communities, and the beauty in the space that surrounds them. Although three of Calgary’s finest were standing near, they declined to take us up on the offer. On January 24, four “obstructors” as SRD styles us—Tim Grier, Dianne Calder, Gordon Petersen and yours truly faced off with an idling bulldozer and fellerbuncher in the forest reserve near Beaver Mines, for a moment of protest Zen. We stared back at the operators, thinking about the events that had brought us to this point, after three weeks of picketing the site. The dude in the tracked fellerbuncher exercised the machine’s giant metal jaws, clacking them open and shut with a noise like a sprung bear trap. We knew the area had been identified as a special place by the Alberta Government in l998. as part of a “network of protected areas” as “a major milestone in the preservation of Alberta’s natural heritage for future generations.” We knew the area is designated “critical wildlife” habitat, yet is part of a mortality sink for grizzly bears traveling up from Montana, where they are classified as an endangered species. In Alberta, grizzlies are listed as “threatened” but Alberta is where Montana bears come to die. We knew there had been no survey to identify bear dens in the cut block, contrary to SRD’s own mandate. We knew that 80 percent of the local population opposed the logging, and we knew that a group of citizens were talking to the Premier that very day in a last ditch effort to get a reprieve for the Castle headwaters. In fact, a group of local people, ourselves included, had been working for years to get the area protected as a wild land park. They had the blessing of a minister of tourism for the project. Eighty thousand people (and counting) had called the premier’s office to try and stop the clear cut logging of the Castle, which provides a third of the water input to the Oldman River drainage and the cities of the plains. Surely the government would not allow SRD to clear cut this vital watershed, when it was so obviously at odds with the PC cabinet’s stated position on the Castle? But we also knew that SRD cared little about any of this. We knew that SRD was determined to log half of the 52 square kilometer license including old growth in these woods and turn whatever was not useable as lumber—40 percent– into garden mulch and fence posts. You see, the more you damage an area, the less likely it is going to be set aside for a park, and the more likely SRD will maintain control of this piece of its turf. All the above citizens, of course, were not there at that moment. We were the point of the spear. I asked the folks at the rally “What would you have done? Would you have stepped aside, let all those folks down and let the destruction begin? Or would you have fought for what is right, for what is sustainable, for what is best for the people of Alberta, for the wildlife and the watershed?” The shouts of approval sounded a bit tentative, I must admit. Nobody wants to tangle with the legal system. SRD may have a legal right to clear-cut, but I would argue they no longer enjoy the social license that goes with it. It’s 2012, not l912 and we cannot support a forestry department that will not give equal weight to all that the forest offers us, in terms of recreation, watershed protection and wildlife habitat. Do we really have to quantify water production in the forest, while water levels shrink in our major rivers? High quality raw water is beyond price, of course. But what about its value in industrial applications and agriculture? If the trees are worth one dollar each to the government in stumpage, (say a quarter-million dollars), I want to know what the forest is worth in terms of enhanced water retention, oxygen production, sequestration of carbon and generation of tourism dollars. Is it worth millions to our economy for these and other services it provides, or more likely, is that measured in billions? You would think that the free market geniuses that run this province would at least figure out that trees are worth more to us alive than they are as garden mulch. These are questions we, as activists, will have to answer with hard facts and figures, since SRD is not going to do the studies for us. And there is another thing we have to do in the future. The people of this province, if they need air to breathe and water to drink, are going to have to recognize that a handful of people, many of them grandmas and grandpas, cannot do at their own expense and at their legal peril what battalions of politicians and bureaucrats are paid very well to do every day, which is protect the environment of Alberta and ensure that projects on our public lands are truly sustainable. We have to turn out at these types of protest actions not by the dozens, but by the thousands, until the current Nexus of Nitwits finally gets the message that talk-talk-talk while you continue to drill, blast and clear-cut will no longer fool the majority. Alberta is a spacious and lofty land that deserves the very best from us. It’s about time we matched its natural grandeur with some newer and grander ideas. Poet and author Sid Marty, is a fourth generation Albertan. In 2008, he won the Grant MacEwan Literary Arts Award for his career contributions to the literature of Alberta. On behalf of the Canadian Parks and Wilderness Society, the Castle-Crown Wilderness Coalition, the Alberta Wilderness Association, and the Bragg Creek Environmental Association, please find the inserted and attached media release. Interview contacts are at the end of this email for further information. Calgary, Edmonton, AB: More than 170 people attended rallies today in Calgary and Edmonton to send a strong message to the Government of Alberta: Albertans love their forests and don’t want the heart of protected areas like the Castle Special Place or poplar trail systems in Bragg Creek to be logged. 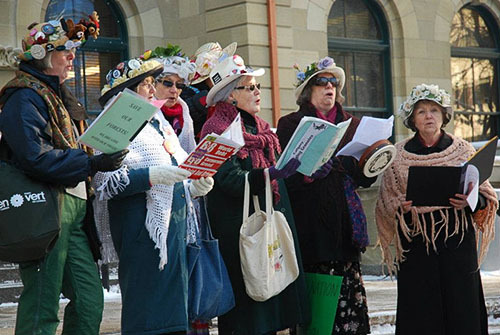 The message for the Valentine’s Day rally the Government of Alberta was clear: there is significant support for the protection of the places Albertan’s love. 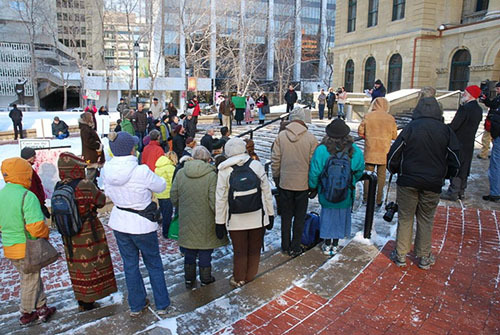 About 130 people attended a rally at the McDougall Centre in Calgary, the Office of the Premier in Southern Alberta while over 40 people rallied on the steps of the Legislature in Edmonton. “Albertans love their forests, their Wildlands, their parks and recreation areas,” said Sarah Elmeligi of the Canadian Parks and Wilderness Society. More than 100 Valentines were sent to the Premier by attendees at the rallies. Groups are encouraging Albertans who could not attend a rally to send a valentine message to the Premier asking that logging in the Castle and West Bragg Creek be halted, and that the Castle receive permanent protection as a Wildland Park. The Premier can be reached at 310-0000 or at premier@gov.ab.ca. Concerned Albertans and local conservation groups will be hosting concurrent rallies in Edmonton and Calgary on Valentine’s Day to oppose some logging operations on the Eastern Slopes. Specifically, people are opposed to the current logging operation in the Castle Special Place (a designated protected area), and are concerned with the lack of public consultation regarding the proposed logging operation near Bragg Creek (a popular recreation destination). The processes by which these logging operations have been planned and approved is concerning to people across the province. CPAWS Southern Alberta, Sierra Club Canada, Alberta Wilderness Association, Castle-Crown Wilderness Coalition, and Sustain Kananaskis have organized two rallies to demonstrate Albertans love for their forests. During and after the rallies there will be photo opportunities and representatives from the environmental organizations will be available for one on one interviews. Edmonton – Front steps of the Legislature – 10800-97 ave.